President's Messge In taking over the presidency of the Early Birds I am fully appreciative of the honor bestowed upon me, of the responsibilities involved, and the magnitude of the work which lies ahead. Much work has been done, much still remains, and with each year the time grows ever shorter. First, the rounding up and enrolling of as many remaining eligible to membership as possible. Each year the number grows less. .Second, the collection and preservation of Early Bird historical data and material. Each eligible non-member passing on is a member lost to the group, and in most cases means the loss as well of valuable historical material, The passing of a member who fails to make provision for the preservation of his data and material means a similar loss. I feel that through our valuable connections with the National Air Museum and the Air Force Museum we now have what we have long sought--a permanent home for our material. Let us all dedicate ourselves to seeing that none of it is lost. 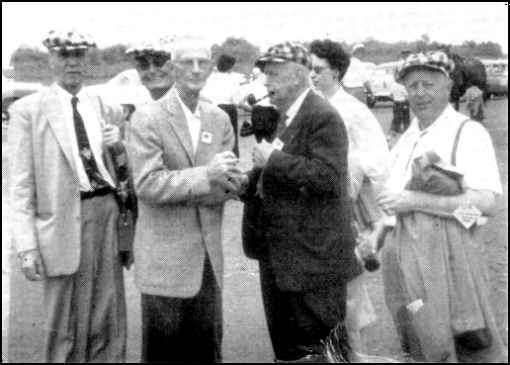 Those of you who were with us in Philadelphia for the 1955 Reunion could not fail to have been inspired by Admiral Doyle's urgent plea that the Early Birds not allow their organization to die out--that some means be provided for keeping alive the pioneering tradition which he feels is so vital in building up the inspiration and morale of our youth. This subject has been discussed many times before, but always with negative results. I will welcome the view of your all on this subject--whether you feel that something of the kind should be done, and if so, your ideas as to how it should be done. Assured Success of the Meeting. Once again the big annual reunion has come and gone, and it leaves a warm feeling in the heats of all EB's who were in Philadelphia for the grand event. Three full days of enjoyable activity, including many special gatherings, left little to be desired. "THE GANG'S ALL HERE" A group of the boys at Philadelphia where fun and fellowship flourished wherever the checkered caps made their appearance. We are indebted to Bill Denehie for sending in this picture. The first bus load of EB's left the hotel for the Philadelphia International Airport, scene of the National Air Show, at 10:45 a.m. followed by the second at noon. The busses were furnished in the name of the Larissa Stronkoff Memorial Foundation through the generosity of Mr. Michael Stronkoff, President of Stronkoff Aircraft Corporation of Trenton, New Jersey. Low ceiling and visiblilty forced cancellation of the Air Force aerial display this first day, leaving the field open for the parade of non-military aircraft, followed by an impressive Naval air demonstration which opened with launchings of aircraft from the deck of the USS Carrier Ticonderoga using her new stream catapults, and closing with the thrilling precision maneuvers of the Navy's famous Blue Angels. In the evening there was the EB banquet at the Franklin Institute, sponsored by the Aero Club of Pennsylvania. Cocktails wre served in the Institute's Hall of Aviation where are exhibited the original notes, wind-tunnel equipment and computations of Wilbur and Orville Wright as well as the original drawings of the 1903 flier. Dinner was served in Franklin Hall and was attended by 178 in all. At the head table were Norman J. Greene, President of the Aero Club of Pennsylvania, Hollinshead N. Taylor, Jr., Vice President, and Ernie Beuhl, a Director of the Club; John MacFarland, Pennsylvania State Aviation Director; Geroge Scragg, EB Treasurer, Ralph Barnaby, and Percy Pierce, the EB's "on-th-spot" committee for the Reunion; General Lahm, who served as toastmaster; and our guest speaker of the evening, Vice Admiral A. K. Doyle, USN, Chief of Naval Air Training, with his Aide, Commander Christian. Admiral Doyle gave an inspiring off-the-cuff talk on the great part which tradition played in the morale build-up of the young student aviator--how study of the history of aviation and the exploits of those who made it was instilled into the young military pilots as a part of their training, and what a vital need it filled. He stressed the unity of the present military air services of the Army, Navy, and Air Force. He had encouraging words to say about our American Youth as represented by the 3000 or more who passed through his hands each year. Admiral Doyle finished by showing a motion picture film depicting the history of Naval Aviation. The next morning, Sunday, Sept 4th, the annual business meeting of the EB's was called to order by 1st V.P. Barnaby in the absence of President deGiers, who was unable to be present because of the serious illness of Mrs. deGiers. Paul Garber waas appointed to serve as secretary pro-tem until the election fo new officers. 43 members were present, which with proxies held by members present, constituted an ample quorum. Details of the meeting are contained in the minutes which are publised in this issue of "CHIRP." 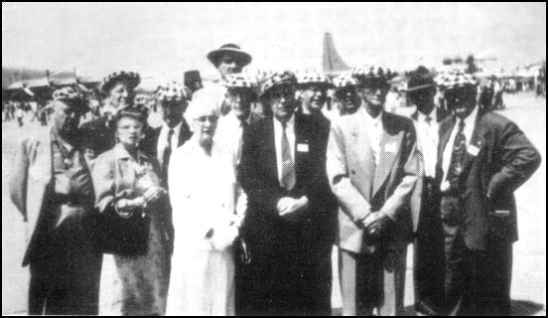 This airport scene shows left ot right (Front row) Ivan Wheaton, Blanche Scott, Mrs. Frank Lahm, Stanley Vaughn, Evan Parker and George McLaughlin: (second row) John Curran, Frank Lahm and others (not clear). The meeting adjourned at noon and the first bus departed for the Air Show a few minutes later, followed by a second at 1:30 p.m. It wa a warm clear day, and the full program of events was completed, including the finish of the Bendix Transcontinental race. 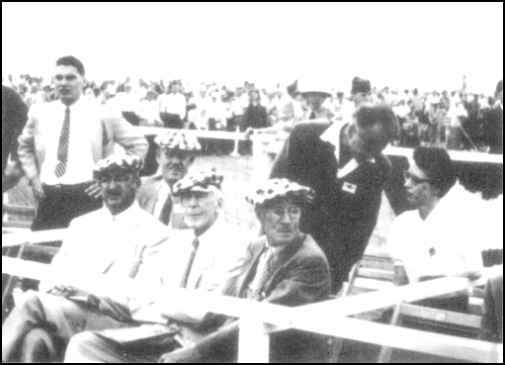 VIEWING THE SHOW In the stands viewing the show at Philadelphia are (left to right in the checkered caps) Sidney Vincent, George Kimball, General Frank Lahm, Art Heinrich and Frank Ellis explaining the show to Frances Wright. (Most of the Reunion photos furnished by John J. Curran.).. Monday morning the first bus load left the hotel at 10:25 a.m. and proceeded directly to the Gulf Oil pier south of the airport where the USS Ticonderoga was moored. Here, with Ralph Barnaby's Naval know-how, the group was able to bypass a waiting line nearly a mile long and get aboard the carrier without delay for a one-hour inspection before joining up with the rest of the group of the Air Show. Although the weather was somewhat overcast, hazy, and hot, the full show was repeated. The last bus returned to the hotel at 5:30 p.m. - and another National Air Show and Early Bird Reunion became history. 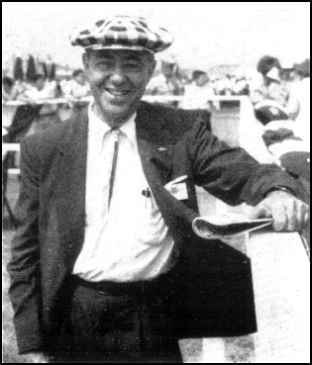 Frank H. Ellis, West Vancouver, B. C.
Elisha N. Fales, Washington, D.C.
E. K. Jaquith, Washington, D.C.
Paul Edw. Garber, Washington, D.C.
Howard C. Davidson, Washington, D.C.
Arthur O. Heinrich, Baldwin, L.I.